Dare! Find a small-town main street offering more than Coeur d’Alene’s. 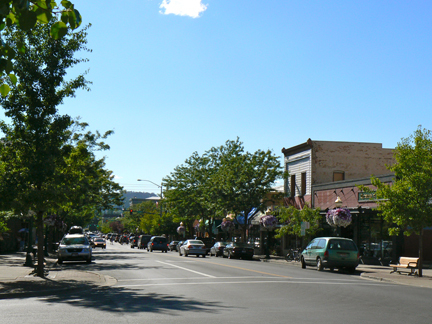 While my family visited Coeur d’Alene, Idaho, we spent quite a it of time in Downtown Coeur d’Alene, the lively little town which sets the scene for more than half of my Rhythms & Muse novel. Hudson’s Hamburgers, with it’s 100-year legacy, is a destination for the most delicious, juicy burgers worldwide! Calypsos Coffee & Creamery, a great coffee venue right off Sherman on Lakeside Ave., where I held my book signing. Coeur d’Alene Chocolates, a family-owned shop with the most beautifully delicious treats I’ve ever seen. 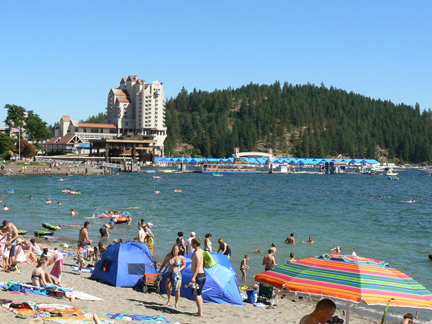 The Coeur d’Alene Resort, a lovely destination towering over the north end of Lake Cd’A right at the foot of downtown, with a marina and one of the largest boardwalks in the world. It’s connected via skywalk to an indoor shopping mall featuring mid-to-high-end restaurants and shops. I’ll be doing future posts to provide additional details on some of these distinctive hot spots, so watch the blog. Do you have a Cd’A story or photo to share? Comment below, or send your .jpg image to me at avidean@videanunlimited.com and I’ll post it in the future. This entry was posted in All Posts, Coeur d'Alene, ID, Rhythms & Muse novel, Words: Serious Play and tagged Ann Narcisian Videan, Calypsos Coffee, Cd'A Resort, Coeur d'Alene, Gallery Northwest, Hudson's hamburgers, Lake Coeur d'Alene, Possibilities, Rhythms & Muse, Sherman Ave., Tubbs Hill by Ann Videan. Bookmark the permalink.